Need to whip up something quick with hungry kids waiting around impatiently? I was in this predicament recently. It was lunchtime. We had just returned from the grocery store so I had only about 15 minutes to pull lunch together before a serious meltdown (not to mention put all the perishables into the fridge)! Well, I had half a can of cannellini beans and some fresh cilantro sitting in the fridge and some tomatoes on the kitchen counter, so decided to try something new. And the result? Fresh Tomato Cannellini Quesadillas. The kids scarfed it up! This is a plant-based, vegan, egg-free, dairy-free, nut-free, and oil-free recipe. It can even be gluten-free, if you use gluten-free tortilla wraps. What are cannellini beans? Well, another less fancy name for them is simply white kidney beans, so you may see this name on cans on the grocery store shelf. Cannellini beans are chock full of nutrient dense goodness. Since the recipe below calls for 1 cup of drained and rinsed cannellini beans, if you were to eat the entire recipe by yourself (which is entirely possible) you would get 12 grams of protein, 8 grams of fiber, 13% Daily Value (DV) of calcium and 30% DV of iron! This quick vegan, egg-free, dairy-free, nut-free, oil-free (and possibly gluten-free) recipe is easy to make and have ready on the table for lunch or dinner. On low heat, place one tortilla wrap in a nonstick skillet (or use a lightly oiled regular skillet) to warm it up. Measure out 1 cup from the rinsed and drained canned cannellini beans into a bowl. Fork mash it well (or use a potato masher). Chop up the tomatoes and cilantro leaves (note: just the leaves, not the stalks), and add the measured amount to the bowl with the mashed beans, along with the salt and pepper and Dijon mustard. Mix well until combined. Taste and adjust the seasonings as desired. Spread the cannellini bean tomato mix onto a new tortilla wrap, and add some vegan cheese shreds (e.g., Daiya brand) if desired. Once the first tortilla is warmed up, remove it from the skillet and place the other tortilla (with the mashed bean tomato topping) into the skillet. Place the first warmed tortilla on top. Turn up the stove heat setting a notch and heat through until the vegan cheese shreds (if added) is melted and the tortillas become crisp. Flip once or twice if desired. Serve warm! For those who need this recipe to be gluten-free, use gluten-free tortillas instead. 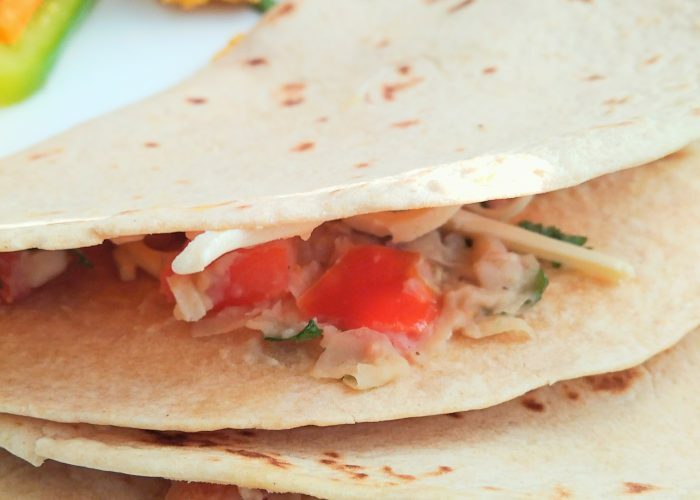 An alternative way to make the quesadillas is to fill only half a tortilla with the tomato bean topping, then fold over the tortilla into a semi-circle shape. Flip once or twice until the filling is heated through and the tortilla has been slightly browned on both sides. Serve with some hummus and fresh veggie slices, avocado slices or fruit. Depending on your taste buds, you could add more or less Dijon mustard and more or less cilantro. I ended up adding about ¾ teaspoons of Dijon mustard and 2 tablespoons of minced cilantro. My whole family enjoyed it, so hope your family would too. It was truly super quick and easy to make. Enjoy! These looks delicious Anna and very healthy!